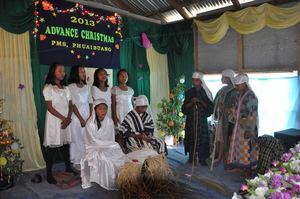 Phuoibuang Junior High School is located in the village of Phuoibuang, Mizoram. The village has approximately 2,000 residents. The school has approximately 180 students enrolled. Phuoibuang is home to a diverse mix of tribes with the Mizo speaking tribe in majority. Most of the villagers are believers in Jesus. The local people are mainly agricultural farmers. Most of them also raise livestock.